What designers can learn from the decade's biggest superhero brand. As Marvel Studios gears up to celebrate its 10th anniversary, we take a look at the typographic trends behind the Marvel movie logos. With a plethora of superheroes to choose from – The Incredible Hulk, Thor, Captain America and more – Marvel has released a new movie each year since its 2008 release of Iron Man, building the brand into one of the most powerful in the world. But with great power comes great responsibility, especially when it comes to the logo design of each movie. So what of the typography? How have the film's superhero logos developed over the last decade? And what can designers learn from their evolution? Here we pick out seven big type trends from Marvel movie logos, and offer insights from designers. One clear typographic trend across Marvel’s 2017 and 2018 movie logos shows many of the designs increasingly returning back to their original comic book roots. Another factor is that many older films were licensed out to other studios. Now, that trend appears to be reversing, with many of the newer logotypes giving a nod to their original comics. The wordmark for 2018 film Inhumans is modelled closely on the 1998 logo designed by Comicraft’s John ‘JG’ Roshell, while the Captain Marvel logo takes inspiration from comic book letterer Jared K Fletcher’s original design. 2016 might have been the year of flat design, but simplification of type continues to be a clear logo trend throughout 2017. Which makes it all the more notable that the newer Marvel movie logos are doing things differently – as showcased by the Avengers: Infinity War logo, which boasts blocky 3D type. “There's been a global design shift towards simpler, cleaner, 'flat' design in recent years so, it's interesting to see this going in the opposite direction,” points out award-winning typographic designer Craig Ward. Earlier Marvel movie logos saw the studio stick to simple typography, with faded hues often serving as the dominant special effect. 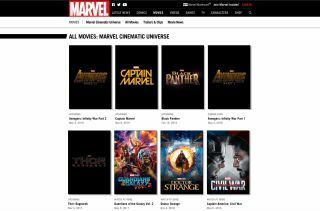 With the new announcements, Marvel is moving into more textured territory, enabling movie titles to say even more about a film's characters and plot, while also popping from Marvel’s standard black backdrop. “One thing that I'm noticing now is how the new graphics have more texture,” agrees designer Paolo Grasso. “The initial logo for Thor: Ragnarok evokes a rocky texture, while there’s a metallic shine on the Guardians of the Galaxy: Vol 2 and Black Panther logos." In Marvel’s earlier movies, the logos largely stuck to its standard silver and red colour palette – with a few exceptions. Lately, however, the typography has shifted towards gold and brass tones, which can be seen in the logos for Avengers: Infinity War and Black Panther. And it’s worth pointing out that the Guardians of the Galaxy: Vol 2 logo was the first Marvel movie to use blue as its main type colour. Looking at the upcoming Marvel movie logos together, the typography of one in particular sticks out as noticeably different to the others. While most of the logos feature square-shaped typography, Captain Marvel veers towards the circular. It’s based on Jared K. Fletcher’s original design, but it’s a noticeable shift towards something different. A similar style was used recently in Spider-Man: Homecoming, perhaps signalling the way Marvel movies target younger audiences. Spider-Man: Homecoming is a light-hearted film (compared to, say, The Avengers) and the hero himself is one of the youngest in the universe. This circular geometric type evokes a youthful sense of fun, rather than a distinguished type used for the older heroes. Speaking of a shift in direction, the latest Thor: Ragnarok typography looks undeniably different to the series’ previous logo outputs. 2011’s Thor saw a thin, metallic design, while 2013’s Thor: The Dark World provided a bold, textured type, similar to the initial Thor: Ragnarok logo. However, a new movie logo was launched earlier this year and its retro gaming aesthetic marks the series’ change in tone. Director Taika Waititi described Thor: Ragnarok as a "70s/'80s sci-fi fantasy" movie – and the type in the new logo represents the new vision. It’s clear from the Thor: Ragnarok trailer that the tongue-in-cheek approach that made Guardians of the Galaxy so successful will be taking centre stage in the new instalment. And while we're on the subject of Guardians of the Galaxy, the same effect can be seen in the Vol. 2 logo. A retro and comic book influence can also be seen with the hand-drawn ‘Homecoming’ in the Spider-Man: Homecoming logo, and ‘Vol. 2’ in the Guardians of the Galaxy: Vol 2 logo. While this mismatched vibe is achieved by using contrasting colours and nontraditional colour palettes, an unusual font pairing can also be an effective way to catch the attention of your audience. Can you identify these superhero logos?